I recently received an email from a Spirit Junkie in desperate need of some guidance. Freaking out about when your boyfriend will propose to you. Trying to control the result of a project at work. Fixated on making something happen on the timeline you want. We all have unique ways of getting hooked into future tripping and trying to control the unknown. What I’ve come to learn and accept is that there is always a solution of the highest good, but it may not be aligned with what we think we need. Our job is to surrender to the fact that the Universe has a plan far better than ours. I’ve found that the more I surrender to the Universe’s plan, the easier it is to move through the discomfort of uncertainty. Ready to let go? In this video blog I share my tips for how to detach from the outcome and let the Universe do her thing. How can you tell the difference between your fear and your intuition? In this interview with Queen Latifah I share my tips on how to distinguish between the fearful voice of your ego and the loving voice of your inner guide! Attract what you want with my free meditations! I created a FREE 4-track album of guided meditations to help you in every area of your life! Attract your desires and strengthen your faith in the Universe… all you have to do is press play and listen. Click here to get your free meditations instantly! It’s like this vlog was meant just for me 🙂 I have been trying to figure out how to get the tuition for nutrition school for months now, and hitting a roadblock and totally doing the “when I haves”…when I have the money then I can go to school, then I can start my career, then I’ll have purpose, then I’ll be happy… I’m going to practice every day surrendering this so I’m not relying on my own very limited vision. You’re so right – I’m looking at this in one narrow way and that’s such a disservice because of course the Universe has a million ways for the best outcome. Releasing that makes me feel happier right now in the moment and that’s really the end goal anyway and it makes me feel like I know my passion to help people is already here and will manifest in the best way it should, regardless of what I “think” should happen. Thank you Gabby! Surrender is my mantra this week. I’m reading your book the Universe Has Your Back. I love it! Question: When you say to detach from the outcome, but be certain of the outcome are you saying don’t force what you want…just know its coming when the Universe delivers it. And act like its already here? Thank you! What if the outcome you are hoping for is a restoration of a relationship? Like with your former love interest? Is this too specific of an outcome? How can one maintain positivity, hope, faith and expectancy, but still remain unattached? Thanks. There is a quote from my book, The Universe Has Your Back, that I think will serve you. “Instead of obsessing about the outcome, focus on how you want to FEEL. I would love to share this story with you Gabby as I think this is a perfect example of what you have to say in this video. One day, my boyfriends friend moved in with us, and he brought his girlfriend with him (And her two dogs). It was suppose to be temporary, and before we knew it, it was 4 people and 3 dogs in a tiny apartment for 6 months. Everything was great at first, we had a lot in common. She loved yoga, and believed in the Law of Attraction and her life was based on positive energy. Or so I thought. We did not get along. She was very controlling and manipulative, and it clashed with my personality. We had gone at it for a total of probably 5 months, and it got nasty. I tried all kinds of things like practicing the law of attraction and believing she was already gone. One day, she got really nasty with me, and started calling me every name in the book. Horrible things that you should never say to anyone. I’m sure you get the picture. That night I was so upset and so angry, until I came across one of your videos. I recently bought a book and saw on Facebook I could have access to a video of yours. It was 2 hours long and I sat down THAT night and absorbed every word you said. After, all I did was say “I surrender. I choose peace” and the next day.. she and her boyfriend were gone. Thank you, Gabby. You never cease to amaze me, and I’m glad I came across you talking on Super Soul Sunday years ago. This was a great piece. Thank you for sharing. This was so well said. Now, I will practice it & follow back up with the magic that I allow the universe to unfold. <3 <3 <3 <3 Thank you Gaby! alex, so cool! right on sister… process lover… i love it! I am a student of the Course..and have never thought “the light has come” could apply to outcomes…I have been diligently spreading light and choosing to be the light, so I thought it was so fitting that you guided me into another way of owing my light. Now I see that being light is about being complete, that in my completeness I can release all life situations. Def..an “aha” moment. Sometimes those lightbulb moments aka miracles are so simple yet profound. Ohh, such amazing timing! I just spent the weekend desperate to release my desire to control the outcome of a particular set of circumstances. I know that when the ego is driving, it wants a very specific result–but that result is so tiny and so limited compared to what the universe does provide when I let things unfold. Surrendering my desire…. I love the synchronistic way the universe give us guidance. I was just emailing someone about looking out for signs. Especially in regards to a recent situation and your email popped up with the perfect title. Surrender and allowing has been the biggest challenge of my life. I was a control freak in the past. Now, with the area of my life that has never run smoothly, I have to detach from the outcome because I refuse to get wrapped up in the emotions and disappointments that only I create. Your tips are perfect, I will be sure to use them. so glad the tips helped! I’m at a crossroads regarding a major decision in my life. I am petrified about the decision / outcome (in both circumstances), like the phrase ‘paralysis by analysis’ – I know I have to let go but it’s so scary. Is there a breathing exercise for when I get those really unsettling moments? Thank you for replying Gabby. After Miracles Now and digital course first time in my life, I start to surrender???? i felt that Universe takes care in her own way, and I do my thing???? today I asked and your vlog answered! Your light has come?????? Thank you, Gabby???? Thanks for this message, Gabby. How do we surrender the outcome yet STILL have the drive, desire and heart to set intentions and really ask God and the universe for what we want? How do we not feel disappointed when our intentions are not being met when God’s plan trumps our own? I’ve had a strong desire for a while to give up meat, but since learning I am lactose intolerant (once one turns 30, man… haha) if I gave up meat I’d be “Vegan” which I don’t want to be in “label.” This weekend I “accidentally” saw the horrors of factory farming. I’ve been buying organic meat for a while which I can only hope is more humane in practices. So after that I felt sick to my stomach — even now. I kept waking up at night seeing the images I saw. But I know that meat is a part of my diet in moderation. So I kept obsessing over it, how can I eat meat after that. I prayed and asked for help. Immediately I heard, “You will never be perfect in everything you want to do. The best you can do is have compassion for everything do the very best you can with what is available.” So I said ,”Ok…I’m listening.” This morning, without thinking, I googled local farms and found one 30 mins from my house. I emailed the farm owner to check on her practices. I won’t be perfect, but I can certainly do my very best and my part to eat as ethically as I possibly can. This was a perfect message for today. Thank you, Gabby, for sharing your light with the world! I am so grateful for your teachings! I started reading your books a month ago and have had a quantum shift in prospective, healing, living and purpose! I cannot tell you how much your light has changed my course in life! May you continue to be blessed and guided to completing the highest good, each day, inspiring everyone on our planet! You rock, girl! I needed this so much with a relationship thing today. omg. you get me. Thanks for this! I am working on this and this email was ANOTHER sign I need to let myself let go of fear. I feel like the universe is asking, how many signs do you need?? 😉 Its all gonna be ok, better than ok! I am planning on going to the Hay House event in NY and I am looking forward to seeing you live! I walked through Central Park this morning for about 90 minutes – the most peaceful and connected time with myself. I sat on benches and watched the world move by. I meditated in The Ramble and stretched on the grass. And the one constant this morning was a tingling in my hands and a lightness within like I was hovering. All my intentions I felt were “out there” and a quiet confidence swept over me – like all I had and have to do from now is be…be me and detach. Thanks Gabby! I really needed this today. I’ve been working so hard on launching my business, trying to make things happen. I never considered surrendering as an option. Just thinking about it makes me feel less panicked. Wow! A few days ago my husband’s business had a massive fire. The last few days we have been working on detaching from the loss and all that is already in motion for what the future holds … New location, focus on best selling products, out with the old habits, etc. Your message comes at the right time for us. It is hard to say goodbye to the past but are trusting in the future. I will be there the 18th in LA so am happy about that too! Perfect timing!!! This hit the spot, Gabby. Going to meditate on it now. ?????????? I needed that soooo much today. I ebb and flow with this whole concept and need to remind myself regularly. I love the moments in that flow, in that groove of listening and allowing guidance to direct you. I find that the busy of life interrupts that and this reminds me of staying open and allowing it to come to me. Thank you. Amazing timing as always… as I sit patiently waiting for response to a recently launched Kickstarter campaign. A lot of energy went into creating the project and, of course, outreach. It’s a tough thing to sit on! However, the upside to all this anxiety is that I know I’ve put something good out there. Something that will help people. Wish me luck! Good Luck with your Kickstarter and other big moves to come! Thank you so much for answering this tweet! On a road trip back from my Labor Day camping trip last week I was talking with my husband about how I’d been caught up in the “When I haves” and I was so sick of it and ready to let that go. Than I listened to the Oldie but Goodie lecturer in Get More Gabby this month where you shared the only thing to focus on manifesting is happiness and now this video. It’s awesome that once you wake up to whats the right path spirit rushes in with guidance from all around (in my case mostly in the form of Gabby B. lol). Thank you so much Gabby for sharing your light so brightly, it’s truly a guiding force in my life. Your light has arrived to me! The synchronicity could not have been more perfect, as I’ve been completely zoned in on the specificities of my next career move all throughout today. I’ve been working to manifest a position in the UK with a company that I truly love, but creating a bridge between my current job and a new opportunity has given me a serious case of the ‘calendar crazies’. Thank you, Gabby! Just right on time for what I needed to hear. I am having a hard time detaching and allowing the universe to do its magic. I live in LA but I am on the east coast visiting family. I want so badly to be able to attend you live event at the end of the week in LA but I don’t see how it can possibly happen. I am in between apartments and I am having a tough time finding a new one from CT. Your teachings are always so inspirational so I want to be in LA but unexpected blessings are happening here and I found a wonderful spiritual teacher here. My agent in LA is itching for me to come back but I cannot logically afford to stay in a hotel indefinitely until I find an apartment. I have really been struggling on this. I have been having anxiety and panic attacks. I often forget how the answers can come when we surrender and meditate and ask the universe for guidance. Thank you, Gabby!! ???????? Right on time, as usual. The other day I was beating myself about something , or rather, some expectations I had about where I should be by now,etc.It was then I sensed God saying, ” everything is happening as it should.This is supposed to happen”.That opened the door to a better perspective and it improved my day tremendously. This was exactly what I need to hear today. In tears… thank you Gabby. Hi, I’m struggling with surrendering my marriage to allow the universe/god/source to do what needs to be done. I pray everyday that I an healed he is healed and our marriage is healed. Days I believe it will return. And feel I’ve surrendered it. Other days I’m broken. I know divine intervention is at play in my life and I know that my desires will come to fruition because when I look back at my life, I have seen it (experienced it) first hand time-and-time again. I’ve been on this journey for over 10 years and know it’s real. Being connected w/ God/Universe is one of the most amazing feelings… which is why I’m so dumbfounded with my current situation. Your message showed up at the right time (no surprise there), because I’m struggling to let God fully take on my job search. I’m at a point where money is running out and fear & panic are setting in. I feel I have done my physical ground work (getting my resume out there, linkedin, ntwkg, etc…), I have prayed & surrendered and I have blocked the ego at every turn. But as time goes by with no results (and I know I’m on divine time here) the ego is becoming more and more manipulative with its negative rhetoric and it’s starting to wear on me. And, even though I keep reminding myself…. –this is all supposed to happen and the only reason the ego is pulling out all the stops is because something is about to shift… just hang in there– …I constantly feel myself slipping back into control mode. This is obviously a great break-through opportunity for me and I want to embrace it full-on, but I’m struggling. Being responsible vs letting go. During meditation this morning, I had a F2F mtg w/ God, and during our conversation, I asked Him what can I do to help?… and he responded… You need to have more fun. So, not what I expected to hear. I totally understand the message, but its hard to leap when the ground underneath you feels so shaky. But I know ‘fun’ will clear my head, take my mind off of the job search (loosen my control) and help to put out positive energy into the universe. Q: I’ve been down this road before, so close to my desire and then I sabotage the outcome for one reason or another. This time I want it to be different. How do you stay grounded, keep the faith, push through when the ego is having its last hurrah? I’d love to have fun w/ no guilt, but how do you do that? Thank you so much for this today…..I have struggled greatly with “letting go” and trusting The Universe and God’s plan for me. This message could not have come at a better time. Surrendering it all is NOT easy for a control freak like myself. But I am a work-in-progress and it’s a day to day practice for me to pray, meditate, and release it all. You’ve given me a new daily affirmation and I thank you for that. Looking forward to busting through this stage of stagnation….Thank you. This vlog couldn’t have come at a better time. I have been applying for multiple jobs, consistently, for months at a single institution that I would love to work for, and nothing came of it. I finally let go of my expectations, focused solely on what the universe had for me at my current position and today (TODAY!!) I received a call for a job interview. As with others, this came at just the right time for me. I cannot express how inspiring your work is and how much I see life improving because of it. I am finally feeling my intuition and feel supported! And i love reading about others experiences. Thank you! Much love to you. You are amazing. I Ask that you pleeease explain this thing that I’m so confused about regarding this topic. What is the difference between controlling and manifesting? How do I manifest and surrender at the same time? Let’s take an example from my own life; I will be moving out of the appartment I’m renting in 3 months. I want to own my own place but not sure if I can afford it yet.. So how do I manifest this new place I will be moving to, without controlling the outcome? Thank you! Love! Thank you Gabby!! Kind of crazy – but this was a lesson for me today that I had to face and then I video blogged about and then I just saw yours!! So blessed to have your as a teacher! Gabby! Amazing episode. You touched very important aspect. thank you for the inspiration!! I am working on surrendering the problem is my husband he can’t surrender his anger towards finances how does he start? THANK YOU Gabby! This was quite literally meant for me. 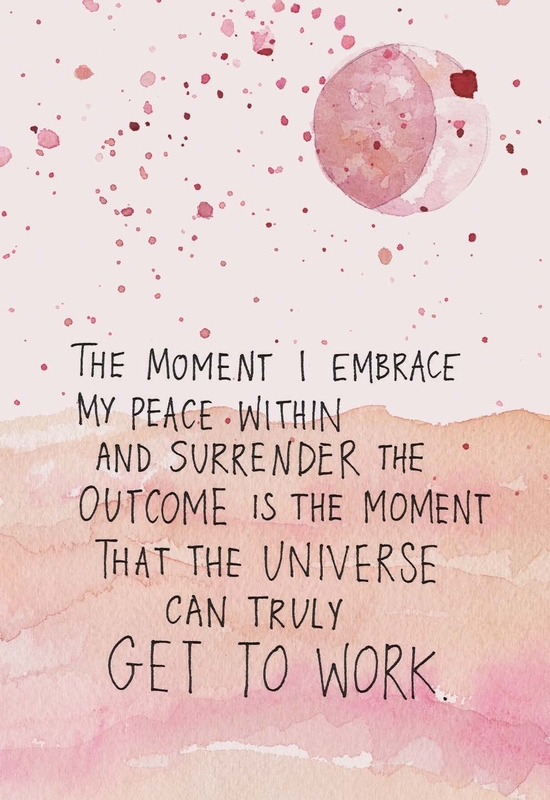 This has been my lesson this summer…surrender to the plans the Universe has for me. They are so much better than mine. I’ve been practicing (more like a labor of love!) letting go of my fear induced thought patterns regarding expectations and outcomes. Today I went on Instagram hoping to NOT see one more blogger post a pic of herself in the Valentino Rockstud heel with distressed jeans and an oversized bag at NYFW and (*ahhh* angels singing!) I saw your post and immediately knew it was for me. I followed the link on your page to here and read your words of wisdom. I especially loved when you said-There is always a solution of the highest good, it just may not be aligned with what we think we need. The best part is learning to accept that this is OK; it’s usually even better! At this point I was feeling all inspired and stuff and went and got my crystals and my miracles now deck and decided I’d draw one to give me inspiration and good vibes while I watched the link to your talk in LA (also amazing). Can you guess what card I picked? “There is always a solution of the highest good.” Of course. It was a beautiful moment of synchronicity and I am so grateful to you for that gift. The clip with you and Queen Latifah about identifying fear verses intuition was very short. I would like to know more about how you can decipher the two. I have been having issues with understanding which is which for years now. Majority of the time fears masks itself as intuition. Would love your clarity on this to give my mind much needed reassurance. Loved today’s lesson. I’m so guilty of always trying to figure out how my future will look. I try so hard to live in the now but I see how important it is to detach from how I think the future should be and truly let go and allow the Universe to guide me. That’s where I need the practice. I need to see the signs and put them into action. Thank you Gabby! Looking forward to seeing you Friday night in LA. So glad your coming back out here! This message is a reinforcement of what the Universe has been telling me lately on top of pulling the same card twice from your Miracles Now deck which says, “I surrender it all.” Perfect timing~ thank you! I guess I am confused a bit — if I use visualization to ‘see’ my outcome, is this not a good thing? Sometimes I think that I am over visualizing to the point where I am forcing an outcome. When that outcome does not come to fruition, then I believe that somehow I am not being positive enough for what I would like to come true. How does visualization and surrendering coexist? Gabi, this is 100% what I needed to hear today. Amazing, but this voice still manages to creep in though and say, “Maybe there is not another plan for you aside from this.” How do I quiet that awful distrustful voice? Thank you! Hi Gabby! Per usual, your video is very timely. Tomorrow I am talking to my boss about all of my financial desires while working for him. This can be a very awkward conversation, so I have been quite anxious this evening thinking about it. Your video was the perfect reminder to live in that abundance now, feel it now, and surrender the outcome to the universe. Love it! Thank you for bringing me peace before I go to sleep tonight. ?? Great reminder Gabby… thank you! i feel like where I get caught up is that I’m wanting to be better at manifesting things into my life, so I am confused at how to fully surrender when I’m trying to manifest. Isn’t visioning and thinking about things part of the process of manifesting? Could you provide some clarity on practicing manifesting while fully surrendering? What if it is not about you but fe for your baby? I have a 4month old little cute boy who has troubles with his digestion… how do you have faith and not want to control it? Just accept what it is and surrender and know it will solve itself? I’ve been experiencing alot of tension with a work situation (retail) between myself and my Manager – she’s rostered me to work every second Thursday night without discussing with me first, as it’s not part of my part time contract days/times. So I’ve been standing very firm in keeping to my contract for this month and November, after I did the alternate Thurs night shifts until the end of August to allow time for another staff member to be allocated the shifts instead. We’re now at a stand-still and I don’t know how/when the issue will be resolved. When you talked about surrendering, I felt my ego strongly disagree with that…as in its interpretation was I should surrender and just do the shifts. But I realise surrendering in this situation really means to surrender to what solution is presented and trust that it will be of the highest good. Also, when you referred to The Course In Miracles Lesson 75 “the light has come”, I felt relieved. Instead of feeling like my Manager’s now not really giving me very much positive feedback, I feel like I can start to let that go. Gabby, you speak of attachment. I seem to have an attachment to things. And it makes me unhappy the minute I get it. Even though I wanted it so bad. Thinking things will make me happy. This really hit home for me! Being a senior in college, and a committed relationship for four years now this September, there’s a lot of pressure from family to “figure it out” from my both me and my partner. A lot of this makes me feel pressured like I need to make a decision right now for everything: get the job, get married, buy a house, have grandchildren..hurry hurry before I’m dead, the family says! How do we trust the universe to have our back when outside voices tell us to hurry up and commit now? Thanks Gabby for your guidance every day! Dear gaby, tired my whole life and thinking ‘when I have enough energy, then…..’ it’s making my sad. Is surrender the solution here? Thnx for your beautiful work! I feel like I should watch this everyday to remind myself that I am already in the light. I feel so much pressure to advance to be this or that, but allowing myself to feel supported and guided towards where I need to be is scary because I feel so vulnerable and weak. In a society that is completely goal oriented where being on top, being the best, promoting oneself is valued and determines your worth — what about just being? I guess finding the balance is the hardest. Being sure to try (and that you’re trying in the appropriate way) and also allowing yourself to surrender (without giving up) can be very confusing. A simple, straight forward message that packed a punch to my soul’s gut. I needed to hear this. So often, I am consumed with a fearful control that takes over my life. My need for control turns to obsession, and I find myself more depressed, fearful, and ashamed of myself for not being any closer to the answer’s I need for my life’s purpose. Feeling like a doubting Thomas, I have to constantly remind myself to S U R R E N D E R. Then forgive myself. I would love to understand more about how to tell the difference between fear and intuition. I suffer from anxiety and I can’t tell whether some feelings are coming from a place of fear, or if it’s my intuition telling me not to let’s say take that job. Oh this is so on pointe for me right now! I have my own business teaching animal workers about compassion fatigue and I have found I am over-identifying with the post-seminar/workshop comments from my participants to validate if I have made a difference. This is leading me to fixate on the one or two that are negative (there’s always one or two:)) and disregard the many positive ones. I see the lesson in SURRENDERING. Thank you Gabby, this is what I’ve been trying to remind myself of for the past 3 months. I’ve been trying to sell my house and have had 2 offers fall through because of my attachment to having the outcome exactly the way I wanted (specifically, it came down to the amount of $). In retrospect, I should have taken my first offer even though it wasn’t the amount of money that I wanted. This has dragged on too long. Now I just want this house off my hands and want to get on with my life. I really need to surrender my attachment to the money and trust that the Universe will provide. There is an outcome I want with a man I am seeing. We are unsettled about our living situation and I want him to move in with me, but it has not happened. I will try to let go this strong desire and expectation and trust that the Universe will support us in whatever is best. Spreading love around – to him, to me, to others and to the Universe itself – is the best plan of action I can think of! As a student that was once unaware of the infinite possibilities of the Universe, I really loved school and constantly dedicated to just getting a good grade. Then as I started to advance and grow spiritually, I did not want anything to do with my major. I was so frustrated in school and annoyed with homework, in total resistance to where my life was…but then I surrendered. I have accepted that this is all part of my process and the Divine has a greater plan. I am exactly where I am supposed to be. I have realized and accepted that this time at my University is benefiting me. I want to travel so bad and just see and experience all of the world’s wonders but that will happen in time and the universe is still serving me now. While I am here the Universe is working in ways so that my future will hold the things I am manifesting now. Beautifully put Gabby. I think sometimes we fret and control as we’re fearful of making the wrong decisions – and this is one of the ego’s favourite illusions! This was definitely the case for me. One day, I was guided to attend a yoga class where the teacher shared this beautiful quote that resonated with part of my being. I write more about this here. By far my favorite video blog you’ve shared. I’ve listened to it several times already and will continue to until it is a living and breathing daily mantra in my life. I probably align to it so much due to growing up in an alcoholic home, becoming codependent thus needing to control outcomes. Thank you Gabby thank you. This brings me hope peace and serenity. The light HAS come! This is so beautiful. Thank you! I want to thank you for being in my inbox, where I ignored you until I was ready to receive your message. I am in the home buying process right now and have been trying to control and orchestrate all aspects of the process to my liking and denying what “is” when something doesn’t go according to my plan. I finally reached a point tonight where I broke down from the fear that I wasn’t handling things properly and I wasn’t getting things done as I “should” be. I was blaming and berating myself on the inside. Then, I remembered your email and it led me to this lesson that mysteriously showed up at the exact moment that I was able to receive it. So, thank you for reminding me to surrender and pray. I know that everything will work out as it will and I can be grateful and joyful no matter what. I choose again! I have so many blessings in my life. I would love for the right man to come into my life that I can build a relationship with and grow. I know words are powerful and I want to come up with a mantra that will help create the right energy for the right man to enter my life. I’m going to focus on what you said in the video of “I surrender this desire to the universe” and make note that “the light has come” but any other things I can do? (Since I have your attention, when will your app for non-iPhones come out? I’m waiting patiently.) Thank you so much. Pingback: Stay Basic – What would Kris Carr, Marie Forleo, and Gabby Bernstein do? Thank you! I have been holding on to a lot of fear of the future and trying to control the help I’ve been needing in my life and not surrendering to the help that is already present. Thank you for the reminder. I was looking for a job for a few months and I was slowly but steadily getting to the point of great frustration. I felt lost and hopeless. One day, I picked up “Miracles Now” from my bed side table (Hadn’t read it for a bit), and opened it curious to see what practice would come up for me that day. It was #35 “Surrender yourobsessions”. From that day onwards I said a little prayer every day: “Thank you Universe, for guiding this desire to find a job. I surrender this to you because I trust, know and believe that your plan is much bette than mine.” I instantly felt better – relieved and secure. Two weeks later I signed the contract for my dream job! So again: Thank you so much for your work! It has transformed my life! they are all a little different and so valuable. im new to my practice and it almost feels in genuine to schedule all three plus yoga in the morning.. help! Hi Gabby and everyone. I am posting almost 2 years after this video went up; I hope someone is still reading these comments. Thank you for this video. I resonate with it, and I am practicing surrendering, but how do we practice feeling that the light has come. I understand the concept, but how do I step into a place of feeling whole and complete when I have never experienced feeling that before? This is from Chapter 11 of my book, The Universe Has Your Back. I recommend re-reading that whole chapter. Gabby, I am in emotional turmoil debating whether or not to leave a relationship, when to do it, people say rip the band aid off but I’m not sure I’m ready etc. It’s been 2 months of hell. Perhaps longer. This book (Which I am only half way through) has truly spoke to me. Iv not formulated my desicion yet but being given the guidance from you I am willing to ask the universe for help and step back and let it do it’s thing. Thank you so much for your guidance so far. I’m sorry to hear you’re dealing with such a difficult decision. My Super Soul Sessions talk on the 5 steps to spiritual surrender + this blog on how to tell the truth may resonate with you and help you. Let’s say that I am trying to manifest something specific by implementing law of attraction techniques, but what I’m trying to attract is not aligned with my destiny and is not for the greatest good of everyone involved (unbeknown to me). Will I not manage to manifest it? Or even if I am destined for it, the universe is meant to deliver it to me at a later stage in my life whereas I am trying to manifest it now. Will my manifestation efforts not come to fruition?